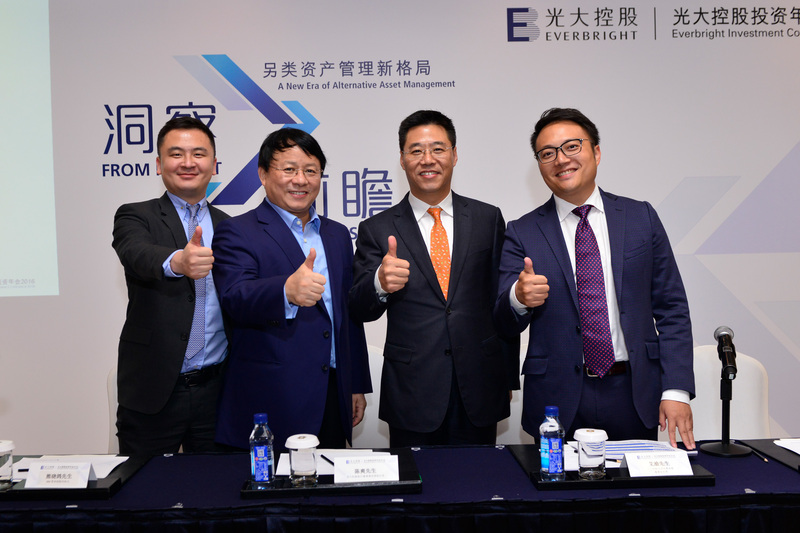 China Everbright Limited (“CEL”, stock code: 165.HK) and IDG Capital Partners (“IDG Capital”) have jointly set up what is expected to be China’s most influential industrial fund - “Everbright-IDG Industrial Fund” (“the Fund”). Following its earlier acquisition of a controlling stake in the Shanghai Film Art Academy, the Fund has recently invested RMB2 billion to become the second largest shareholder and a board member of China UnionPay Merchant Services Co., Ltd. (“China UMS”), China’s largest bankcard acquirer and China’s third internet-enabled payment service provider. The Fund will be actively involved in China UMS’s business integration, and set out to develop the third-party payment market. The Fund was initiated early this year, officially launched at the end of June and invested in its first project at the same time. The fund targets on sectors including financial technology and internet banking, entertainment and education, mobile e-commerce, as well as LED and semiconductor, where it has already invested in flagship projects. Since its launch, the Fund has made a total investment of around RMB10 billion in different countries and markets. The Fund focuses on industry leaders with mature business models and high market recognition. As China’s leading third-party payment service provider, China UMS is an iconic name with great brand value, as it has consistently taken the largest market share in the payments and acquiring sector. Fintech sector including consumer finance and internet banking has attracted investors to compete for investment opportunities. China UMS has many years of experience in the acquiring and payment sector, its bankcard acquiring service covers 337 cities above the prefecture level, and serves over 5.7 million merchants through a network of 7 million POS terminals. By building on a strong network of merchant resources and a well-established payment and clearing system, China UMS has built a massive and reliable database for merchant operations that lays a solid foundation for subsequent development of financial services. The Fund was built on a strong resource foundation of CEL and IDG Capital. Capitalising on China Everbright Group’s full investment licenses and market influence, as well as its own investment experience of more than 15 years in the industry, CEL aims to be the foremost cross-border asset management platform in China. Together with overseas investors, CEL has identified and cultivated many Chinese enterprises with high growth potential, through an international management platform and dozens of its funds. IDG Capital was the first international investment company to enter the Chinese market, with considerable resources and investment experience in areas such as TMT, healthcare, industrial technology, retail, as well as culture and entertainment. It has invested in companies that have played important roles in the development of the internet, such as Baidu, Tencent, Sohu, Ctrip and Xiaomi. Combining their strengths and investment expertise, CEL and IDG Capital is now able to work hand in hand to create a prominent fund. The Fund is not just an asset investor, it sees the importance of being involved in its investees across the value chain. By actively leveraging capital and extensive management experiences, it can seize the industrial upgrading trends and offer investees broader market prospects and unprecedented opportunities for rapid growth. Against the backdrop of China’s economic transformation and consumption upgrade, the Fund sets its sights on dynamic IPOs, M&As, restructures, and spin-off opportunities in emerging economies. The Fund’s key portfolio covers internet and mobile services, leisure and entertainment, artificial intelligence, healthcare and education. The Fund’s focus is on first-tier industry projects, cross-border M&A, industry and sector leaders and enterprises that are slated to become major market players. Connecting these companies with the Chinese capital market, to provide them with services including investment, financing, M&A, sector integration and management incentives, while creating added value throughout the whole process, providing post-investment management and divestment. The fund provides comprehensive and multiple-level service for investees. For instance, the fund has recently invested in HC SemiTek Corporation, supporting the company’s development in LED upstream industry and expanding from its core business to semiconductor industry. The fund also partnered with Forest Lighting to acquire Osram’s global business to realise synergies on technology, market, channels and brands. "As a first class cross-border asset management platform in China, CEL rides on the investment opportunities in China's industrial restructuring, consumption upgrading, as well as Internet plus and related industries, to accelerate our new strategic approach for sector investment this year. I believe partnering with IDG Capital through Everbright-IDG Industrial Fund will enable us to integrate our elite teams and experiences and resources in sector investment, as well as domestic and foreign capital operations, to establish the most influential industrial fund in China, and share with investors the opportunities brought by China's economic restructuring and upgrading, and the opportunity of steady development of capital markets." said Chen Shuang, Executive Director & Chief Executive Officer of CEL. Hugo Shong, Founding General Partner of IDG Capital, said, "IDG Capital is among the first batch of international professional investment institutions to enter the China market. We have rich resources and investment experience in TMT, healthcare, industrial technology, retail, as well as culture and entertainment industries. Over the years, both IDG Capital and CEL have built broad and in-depth reach in TMT sector investments and a wealth of experiences in corporate governance and asset restructure. I believe the partnership between IDG Capital and CEL will not only maximise synergies for our clients, but also enable us to grow along side with them and bring opportunities throughout the industry chain to drive growth."